Bear Church Rock is an 8-mile moderate hike at Shenandoah National Park. It features lovely streams, peculiar vegetation and rewarding views at the top. It’s also a very secluded area compared to other hikes at Shenandoah. We hiked this trail on a very cold Sunday, but had a great time. The first 3 miles were pleasant, along streams, boulders and small waterfalls. After the third mile, the trail becomes steeper as it climbs towards the mountaintop, leaving the rivers behind. It winds around the mountain through a surreal tunnel of old twisted laurels. 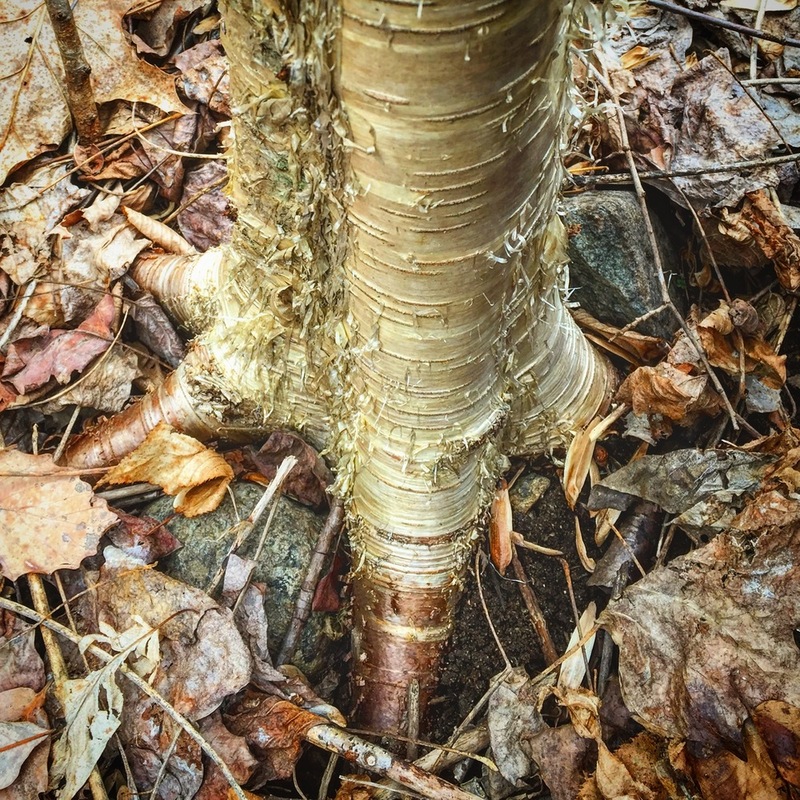 We found multicolor mossy rocks and trees with golden trunks that seemed to have feet close to the streams. The spooky laurel tunnel near the top is the highlight of this hike, although every mountain is unique with its own vegetation, colors, sounds and energies. After two hours of hiking, we arrived at the top, which offers a spectacular view. The early-spring day was windy and cold, so we took shelter between granite rocks to have lunch comfortably. The passing clouds that came from the west created harmonious shadows over the woods, in contrast with the shiny sections of the forest that were directly lighted by the sun. That created a moving environment of shapes and a truly spectacle for our eyes. 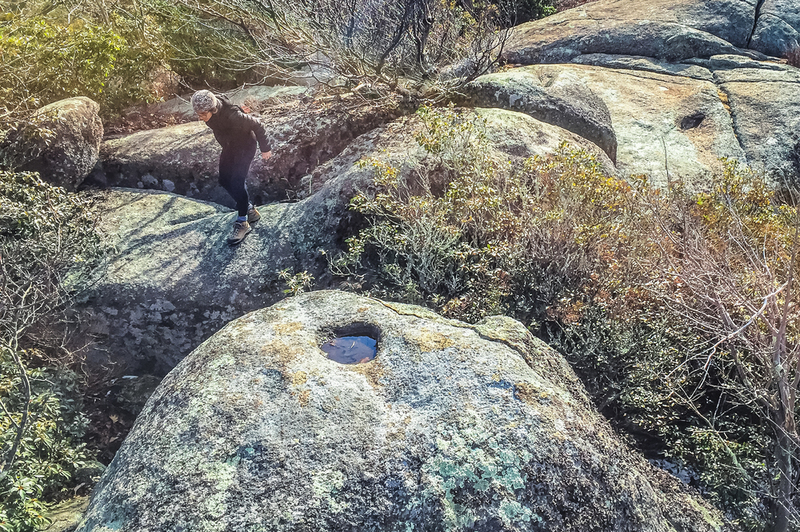 We also appreciated the round granite rock formations sculpted by wind, air and water. After enjoying the view, we retraced our steps back to the parking area. We still had enough time and daylight left to wet our feet in the water at the end of the hike, which was very refreshing. We watched an amazing sunset in the woods and said goodbye to the beginning of spring in Shenandoah Mountains. In spring we came back here to spend a sunny day in the pools and waterfalls along the Staunton River. A warm spring weekend finally came! We woke up at 6am, left Washington DC and headed there. On the road we could already see that spring had just arrived in the mountains. There was no longer a brownish winter atmosphere, but bright and colorful flowers and green leaves instead. We even stopped on the country road to breath fresh air and enjoy the view. From the trailhead, it's just a 1 mile hike to reach the set of falls and pools. We brought a hammock, books, tea, food, cameras, and more important: swimming suits! The water was very cold, but it was totally worth to take a bath in such pristine river, surrounded by flowers and multicolor butterflies. During warm spring days countless new born butterflies can be seen along the stream. Be sure to spend a couple of minutes at the riverside to spot a kaleidoscope! At the end of the day we hiked to the top of Bear Church Rock to enjoy the overlook. This is one of our favorite areas in the Shenandoah National Park and we look forward to come back again soon. 1. Drive to the Rapidan River (lower lection) Trailhead, VA (GPS: 38.43690,-78.36906). Park here. 2. Hike the Graves Mill trail (yellow) along the river for 0.5 miles to the junction with the Staunton River trail (blue). Turn left and hike 2 miles until it intersects the Jones Mountain trail. 3. Turn left and hike the Jones Mountain trail (1.5 miles) to the overlook. In the junctions, just keep hiking upward to the overlook. At the last intersection there is a side trail to the left that leads down to the Jones Mountain Cabin. The side trip to the cabin is 0.6 miles out and back.